A quick post for an even quicker side dish. 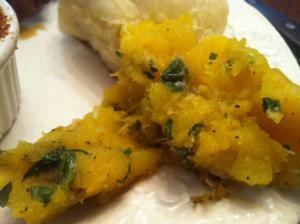 Try this delicious Garlicky Baked Butternut Squash. The recipe is so easy and delicious. I used bags of pre-cut cubes of butternut squash. Just thaw. 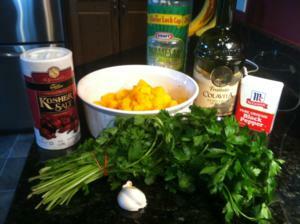 In a large bowl, combine the parsley, oil, garlic, salt and pepper. Add squash and toss to coat. Transfer to an ungreased shallow 2-qt. baking dish. Bake, uncovered, at 400 degrees F for 50-55 minutes or until squash is just tender. Yum! I love butternut squash and garlic, will definitely try this! This looks SO good! I can’t wait to try it ! Great timing – I have a butternut squash I need to use and was trying to think of something different to do with it! Thanks. This sounds delicious. I usually roast it for soup, but I’ve never eaten it as a side/veggie. I passed your link along to a blogger friend who has a garden full of these delicious squashes and, like little Jack Horner, she didn’t know what to do! Now THIS is a recipe I may be able to handle! 😉 PERFECT for the FALL. Thanks!!! This looks so amazing. I’m just not sure if I can find the butternut squash. Oh yay!! I love butternut squash but have never made it before! Dang it! I forgot the cheese. I bought some squash today because I was going to try this, but I don’t have Parmesan! Hmm . . . .
was just looking for a recipe for butternut squash, remembered seeing it on your blog so I went searching for it. I really enjoy reading your blog, makes me want to cook immediately.